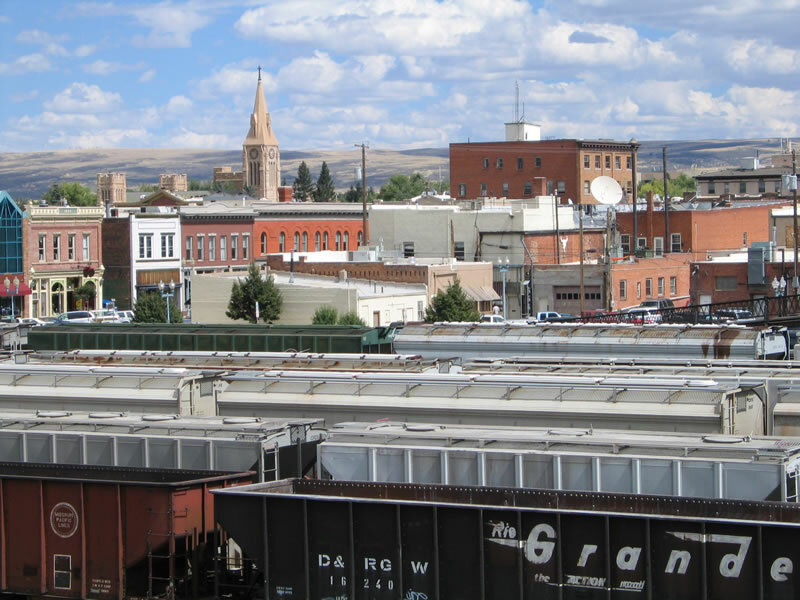 Downtown Laramie lies next to the Union Pacific Railroad yard. Old Western-style buildings line the edge of the railroad tracks, bringing together the working railyard and the many businesses in the historic downtown district. 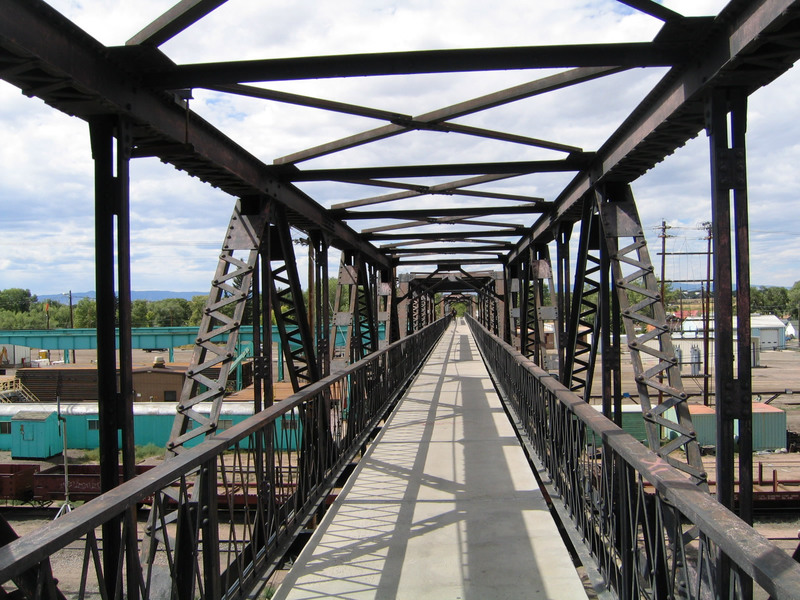 This view is taken from the pedestrian bridge that crosses over the railroad yard. Photo taken 09/07/05. 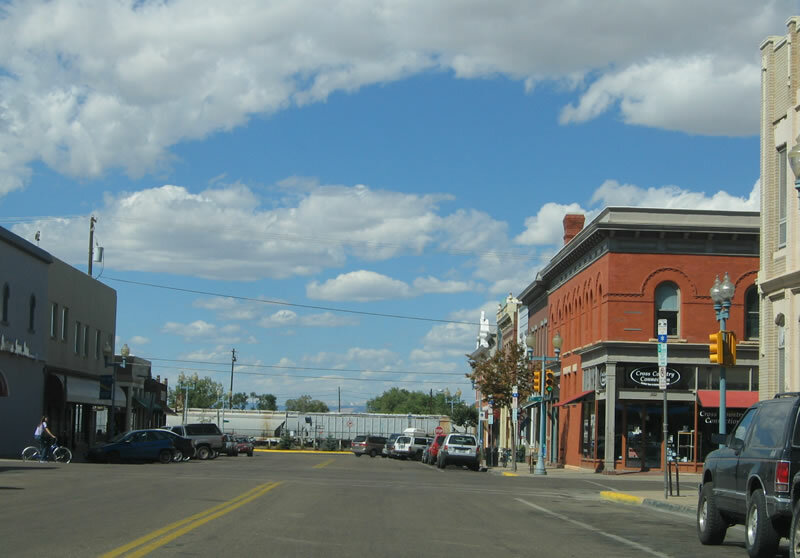 The city of Laramie ("The Gem City of the Plains") had a population of 30,816 as of the 2010 Census and 27,204 as of the 2000 Census. 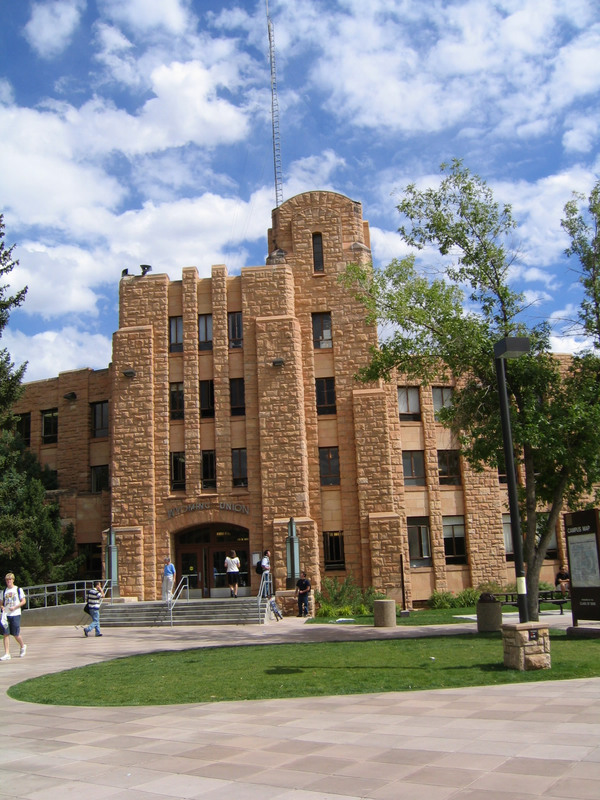 Due to the presence of the university, the population of Laramie is rather fluid and transient, with students leaving during the summer months. 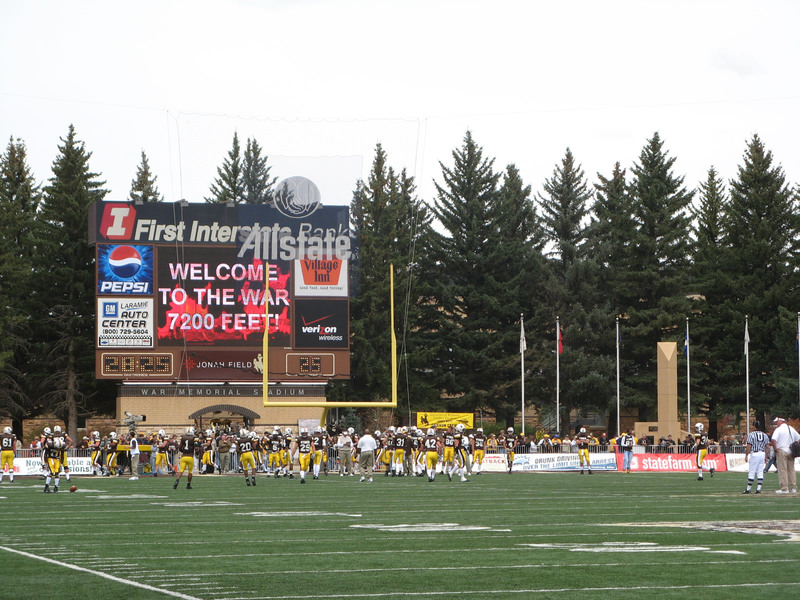 The elevation of Laramie seems to vary depending the source: the university cites 7,220 feet above sea level at War Memorial Stadium, while the chamber of commerce places the elevation at 7,165 feet above sea level, perhaps closer to downtown Laramie. 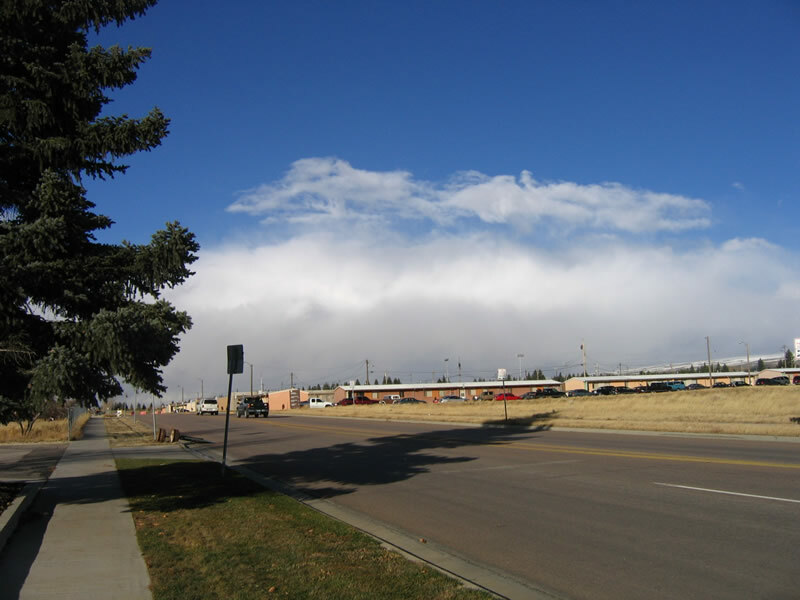 Annually, 10.88 inches of precipitation (rain and snow) falls in Laramie, with 36 inches in the form of snow. Perhaps the most famous weather statistic is the wind speed, which averages 12.8 miles per hour! Map of Laramie, Wyoming, created by Kelly Nitzman. 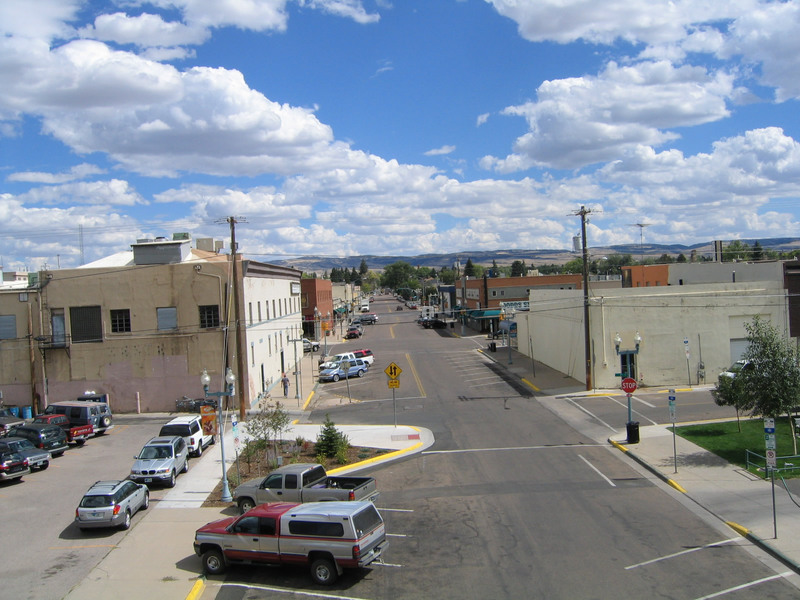 Laramie was the home to Matthew Shepard, a young man who was murdered in 1998 in what is now considered a hate crime due to his homosexuality. 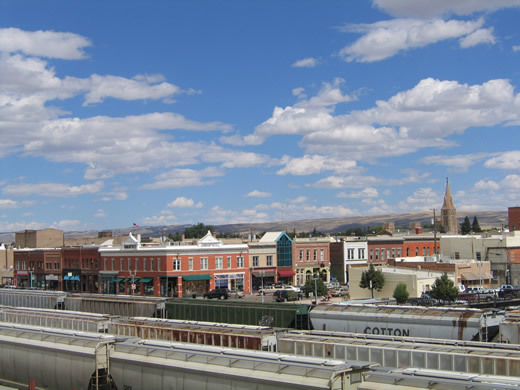 In spite of this event and its aftermath that challenged the notion that Wyoming is the "Equality State," Laramie generally is a safe place to live and work, and its crime rates are well below the national average. Mr. Shepard's story began with his abduction by locals Aaron James McKinney and Russell Arthur Henderson. The two beat and robbed him, and then left him to die while tied to a fence away from town. His body was found while he was barely alive, but rescuers were unable to revive him. The two suspects in this crime later admitted that they beat Mr. Shepard because of his homosexuality. For more on Matthew Shepard and the impact of his untimely death on Laramie and the world, we recommend the play and film The Laramie Project. 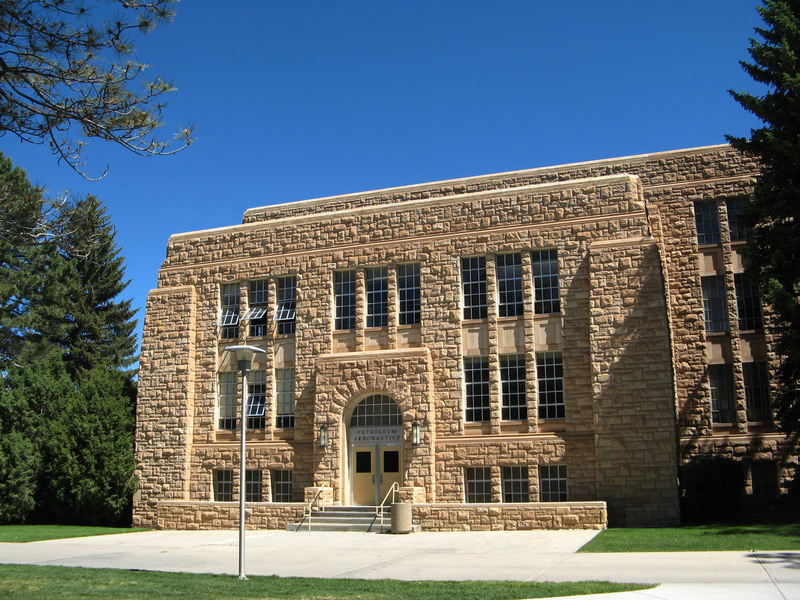 Home to the burgeoning University of Wyoming, Laramie sees its population swell during the school year when over 13,000 students attend classes. 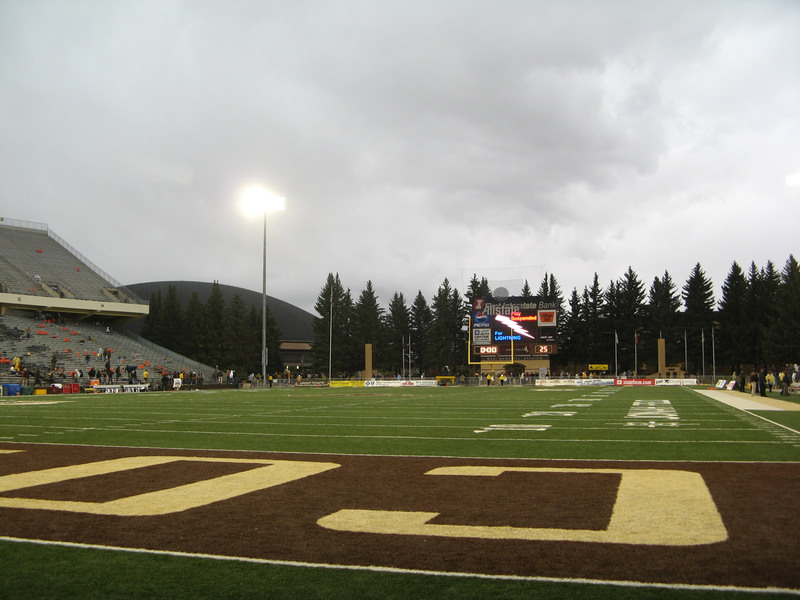 Some of the major attractions at the university include the American Heritage Center, the War Memorial Stadium (football), Arena-Auditorium (basketball), and various museums and exhibits. 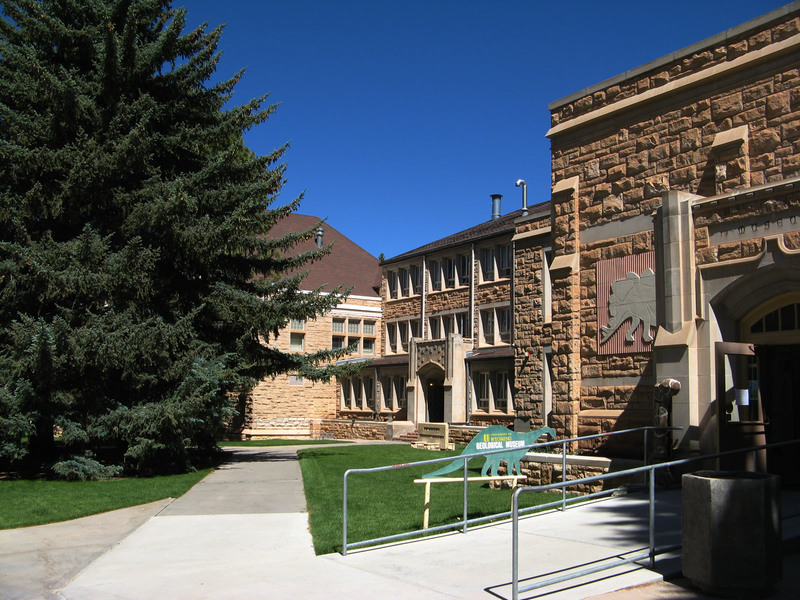 One of the most popular museums at the University of Wyoming is the geology museum and library. First Street parallels the Union Pacific Railroad alongside the railyard. 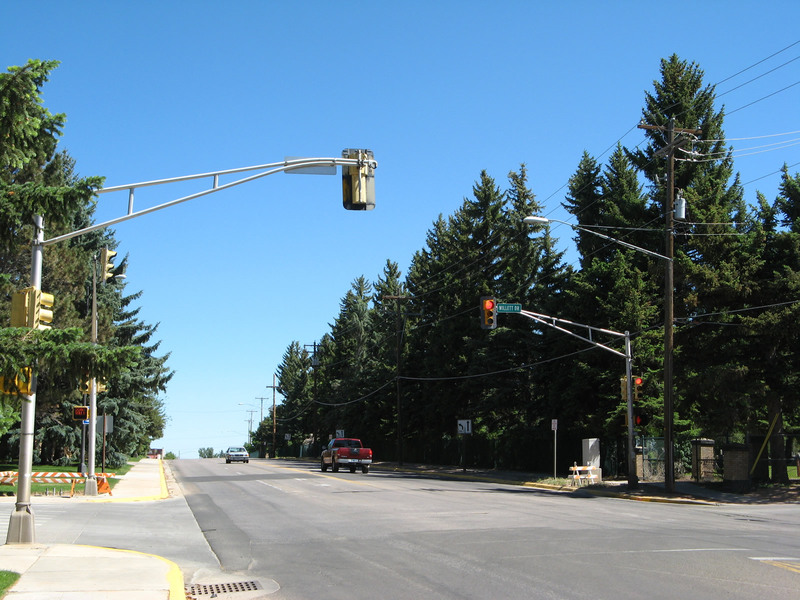 A one-way street, First Street allow vehicular traffic to travel southbound only. The extra space allows for parking adjacent to the railroad. When a train passes through at full speed, the road shakes from the locomotives' vibration. 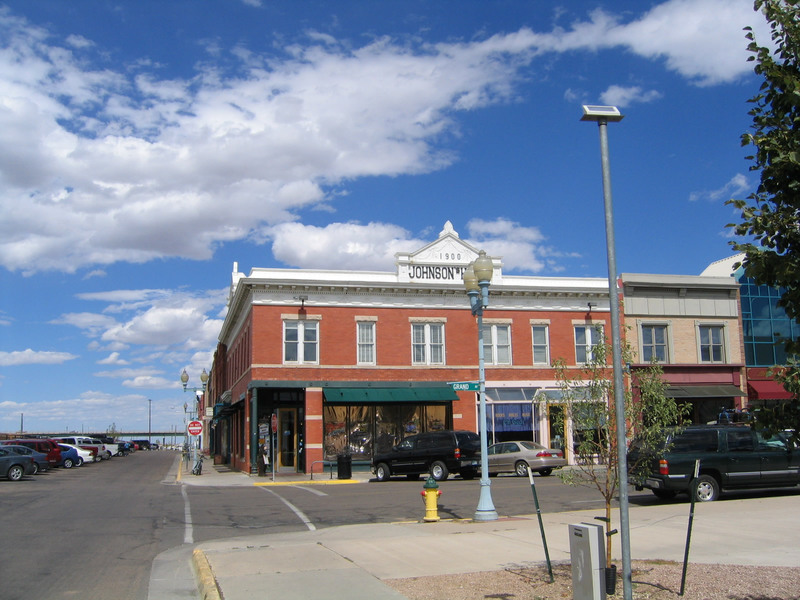 Here, northbound First Street approaches Grand Avenue, with the Johnson Hotel Building facing the southern and western corners of the block. Photo taken 09/07/05. 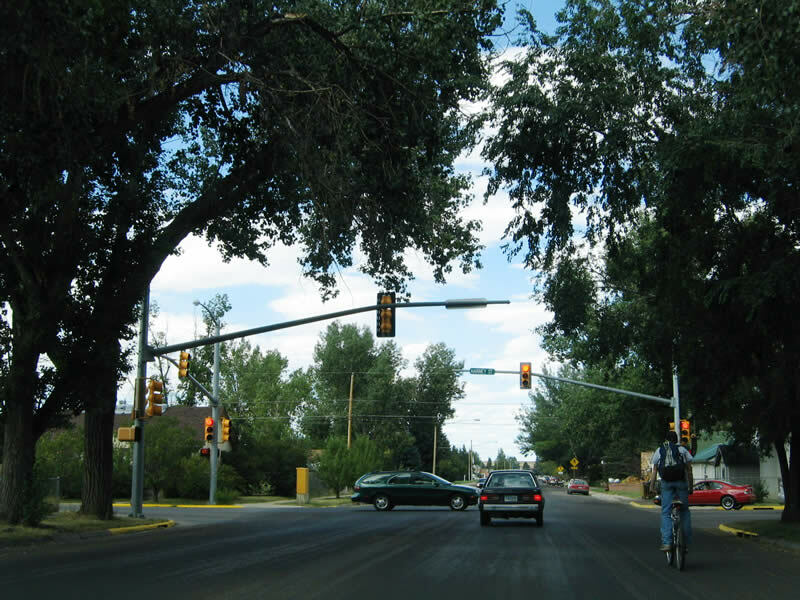 Grand Avenue is a major east-west route that extends from First Avenue at its west end all the way to the trumpet interchange with Interstate 80 east of downtown. All but the westernmost two blocks of Grand Avenue are part of Business Loop I-80 and U.S. 30. Photo taken 09/07/05. 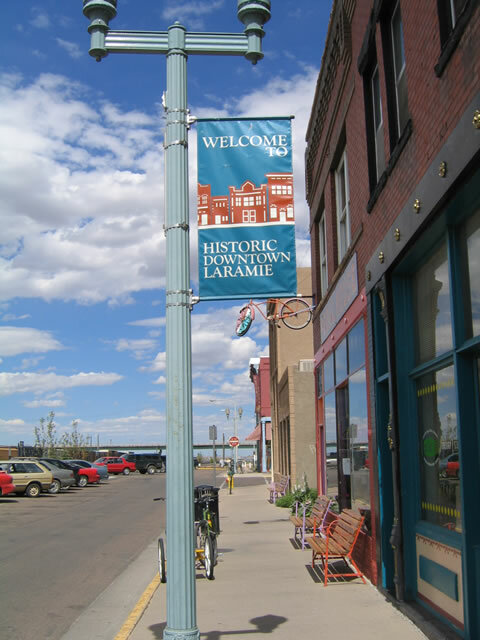 A banner touting downtown Laramie as a place of history is posted on one of the many street lamps along the street in the downtown area. Photo taken 09/07/05. Here, northbound First Street reaches University Avenue. 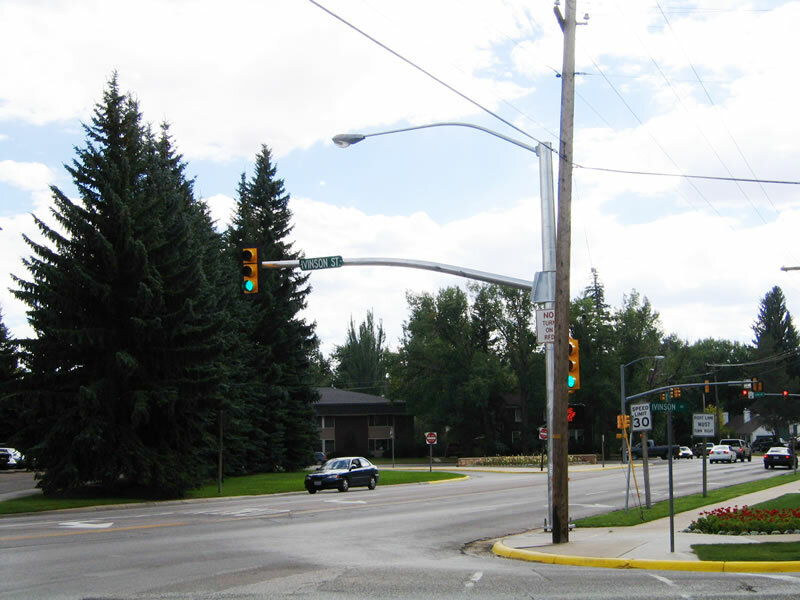 All traffic must turn east onto University Avenue; First Street comes to an end here. A vacant lot to the north of University Avenue allows for a clear view all the way to the Wyoming 130-230 viaduct over the railroad. Photo taken 09/07/05. 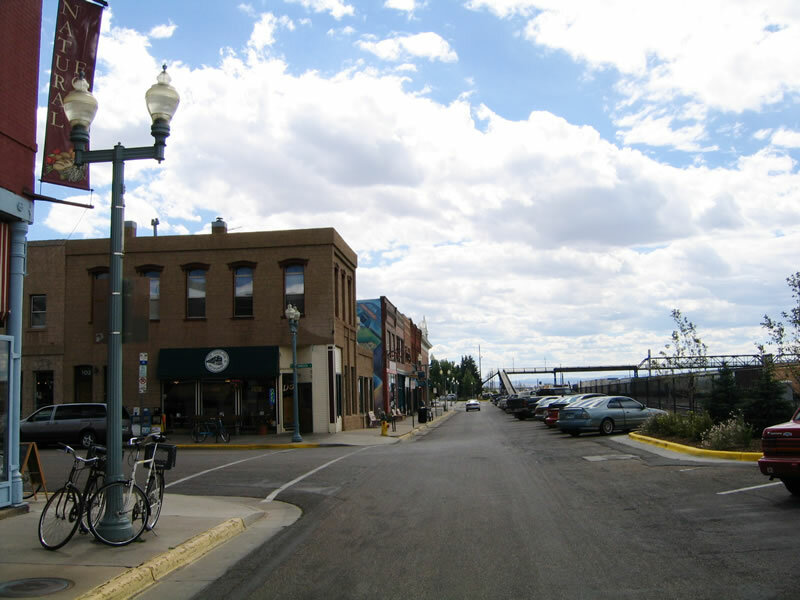 Here is a view of downtown Laramie as seen from southbound First Street. The Overland Restaurant is located at the southeast corner of the intersection of First Street and Ivinson Avenue. Photo taken 09/07/05. 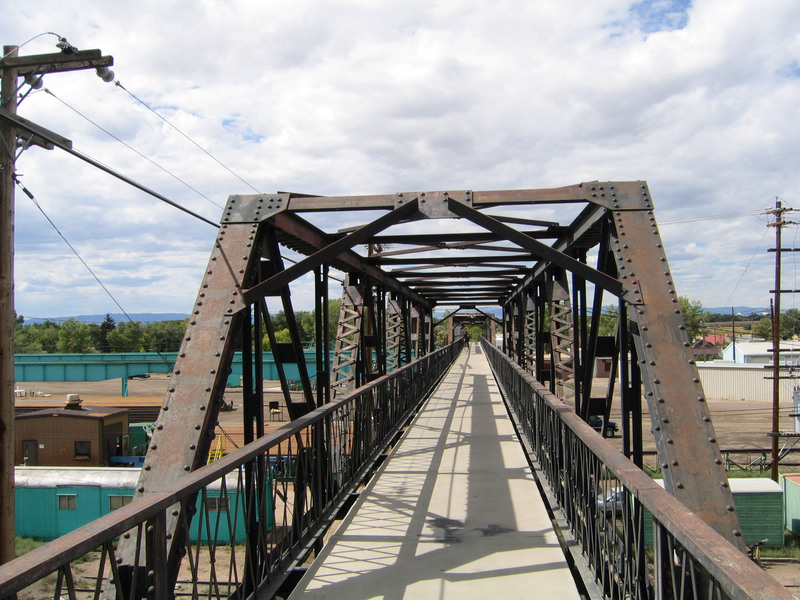 This steel truss bridge allows for pedestrian and bicycle passage over the Union Pacific Railroad yard near downtown Laramie. Photos taken 09/07/05. 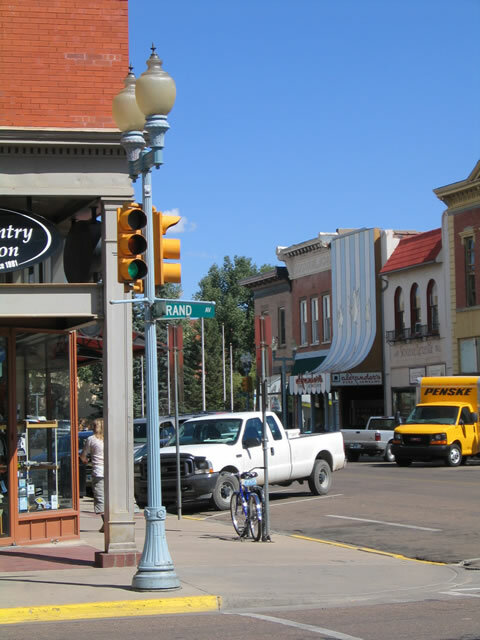 Second Street parallels First Street, and a wide variety of shops is located on Second Street, including book stores, antique shops, gift shops, a music store, and clothing stores. This view shows northbound Second Street at Grand Avenue. Photo taken 09/07/05. 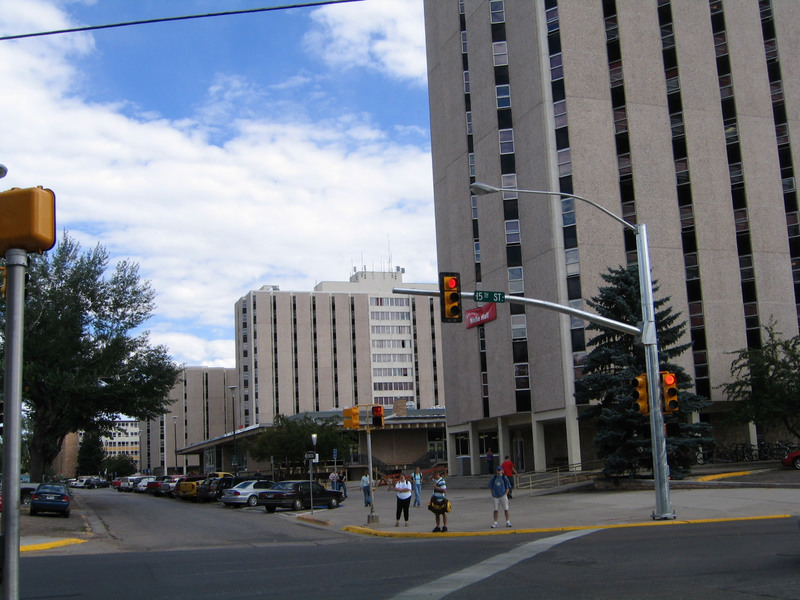 One block north of Grand Avenue, northbound Ninth Street approaches Ivinson Avenue, which forms the southern boundary of the main campus of the University of Wyoming. Old Main is located to the right of Ninth Street after the Ivinson Avenue intersection. Photo taken 06/30/08. 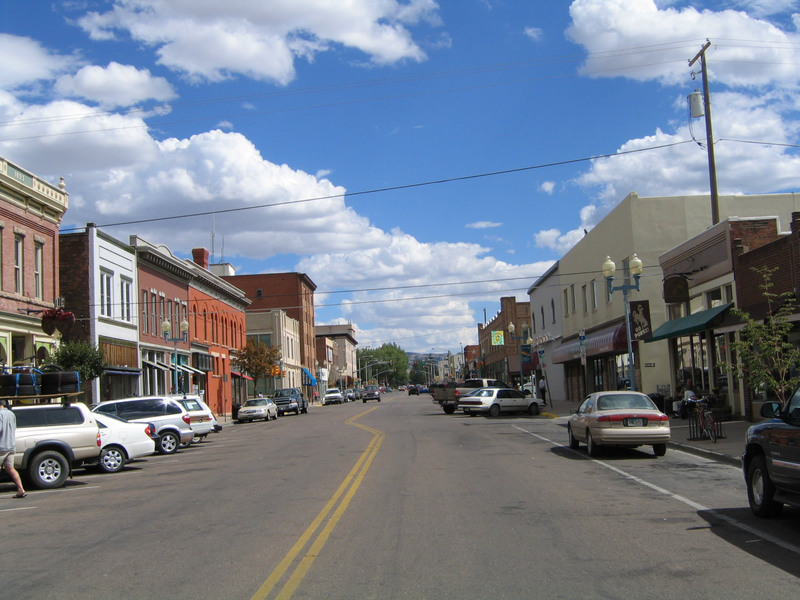 Continuing north, Ninth Street next approaches University Avenue, which travels west to downtown Laramie. Photo taken 06/30/08. 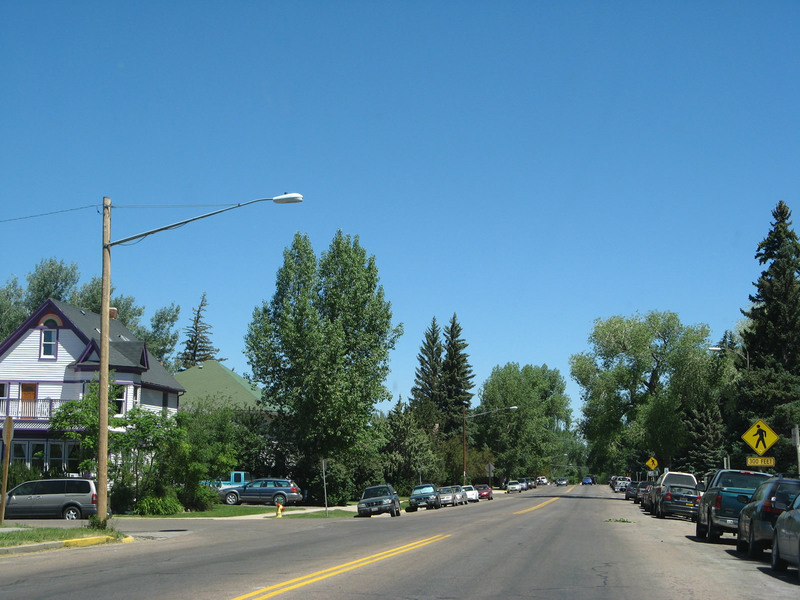 Near the northwestern edge of the University of Wyoming, Ninth Street approaches Lewis Street. Lewis Street forms the northern boundary of the main campus. Photo taken 09/07/05. 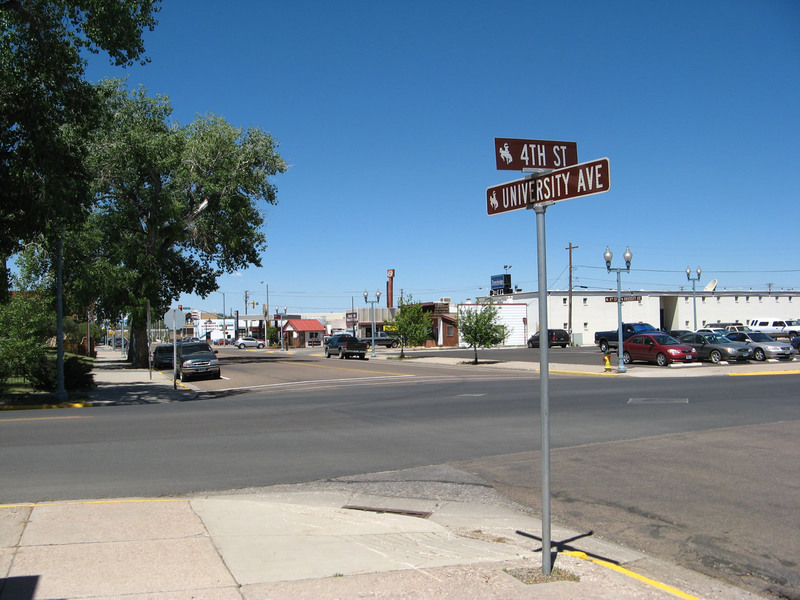 A bit further north, the next major east-west street to intersect Ninth Street is Harney Street. Photo taken 09/07/05. 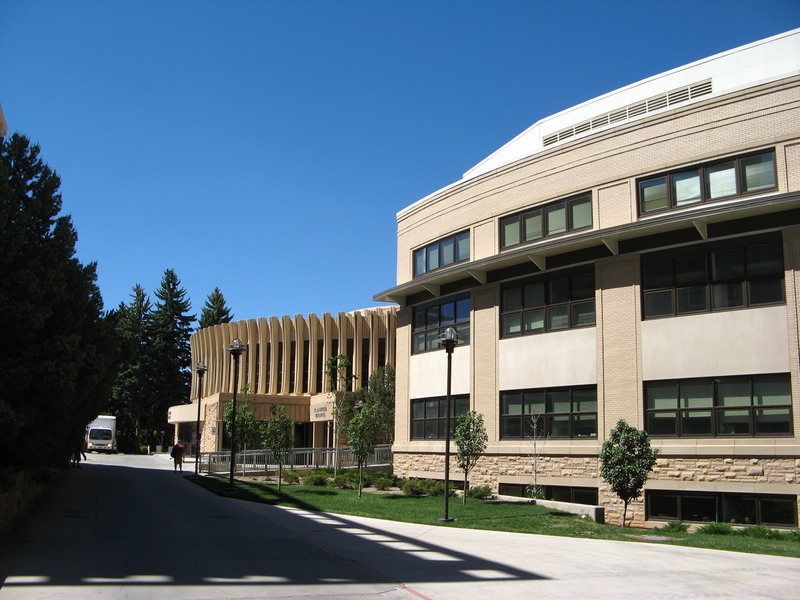 Sprawling Knight Hall, which contains the office of Admissions and Records for the university as well as other administrative functions, is located to the north of the intersection between Twelfth Street and Ivinson Avenue. Photo taken 09/07/05. 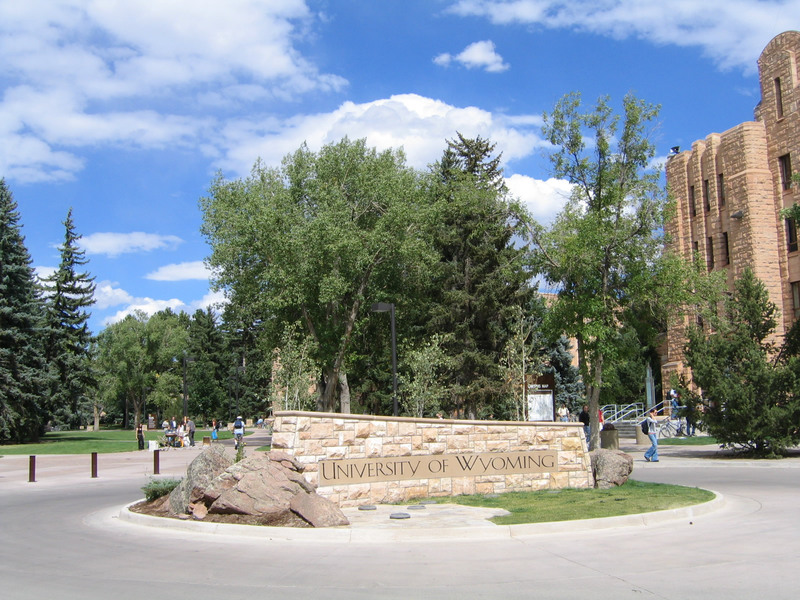 Thirteenth Street actually enters the University of Wyoming campus, but it ends at a cul-de-sac between Ross Hall, Prexy's Pasture (quad), the UW Union, and William Robertson Coe Library. Photo taken 09/07/05. 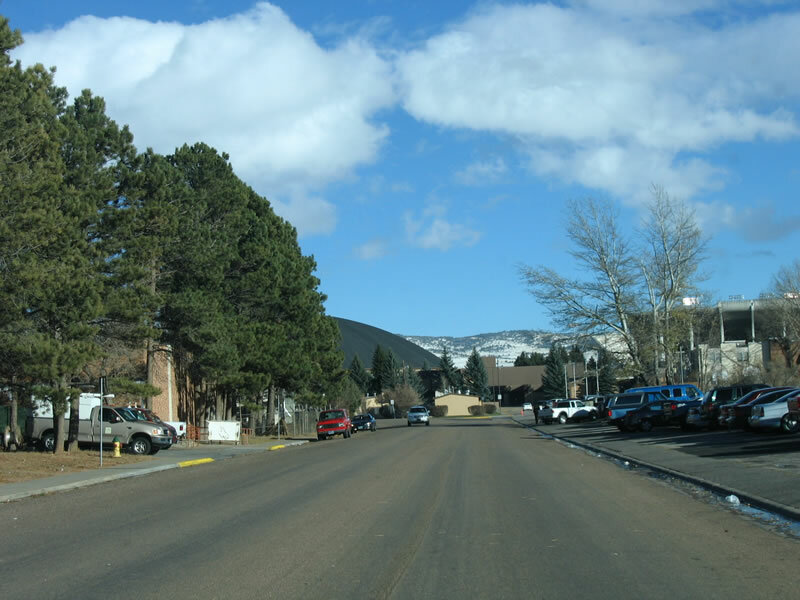 This view looks north along 15th Street between Ivinson Avenue and Sorority and Fraternity Rows within the University of Wyoming campus. Photo taken 06/30/08. Northbound 15th Street next approaches Willett Drive after passing by Sorority and Fraternity Rows. Photo taken 06/30/08. Near the main university dormitories (White Hall, Downey Hall, McIntyre Hall, and Orr Hall), 15th Street travels south toward Grand Avenue from Ivinson Avenue. Photo taken 09/07/05. Northbound 22nd Street approaches War Memorial Stadium (which is on the west side of the street). 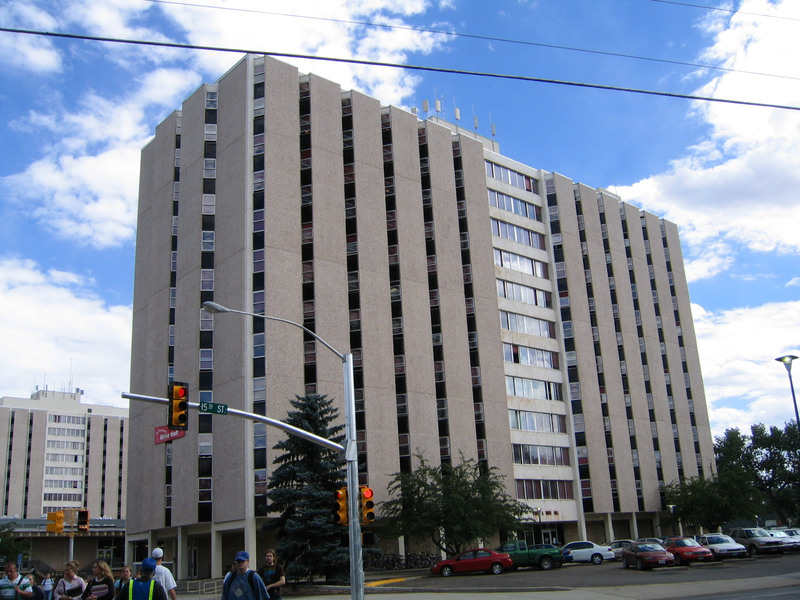 To the east lies a vacant area owned by the University of Wyoming as well as married student housing in the background. Photo taken 11/22/05. 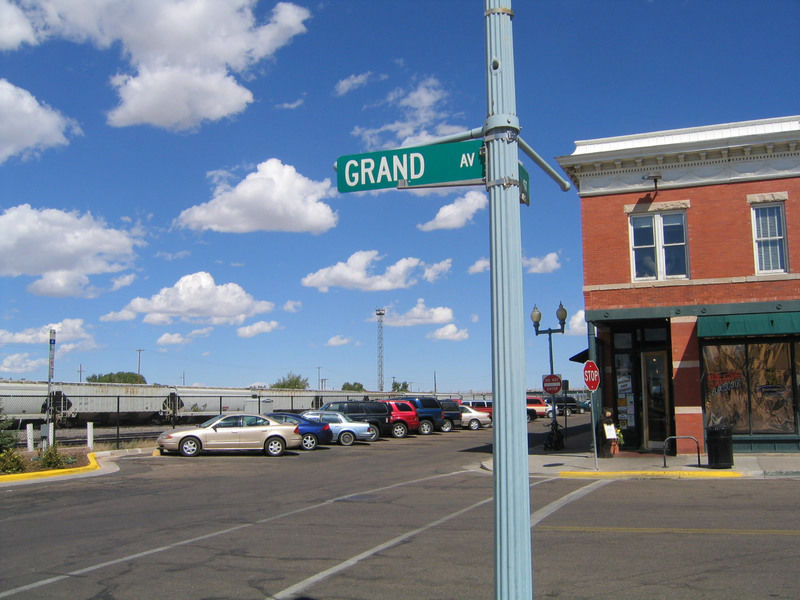 Grand Avenue begins its eastbound journey here at the intersection with First Street, near the Union Pacific Railroad. 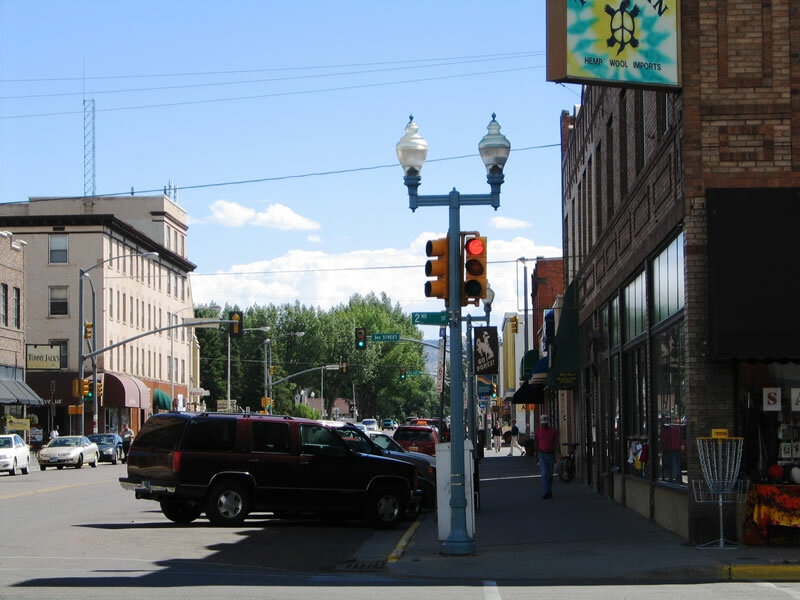 This photo gives a fair perspective of all of the shops that line Grand Avenue between First and Third Streets. Photo taken 09/07/05. 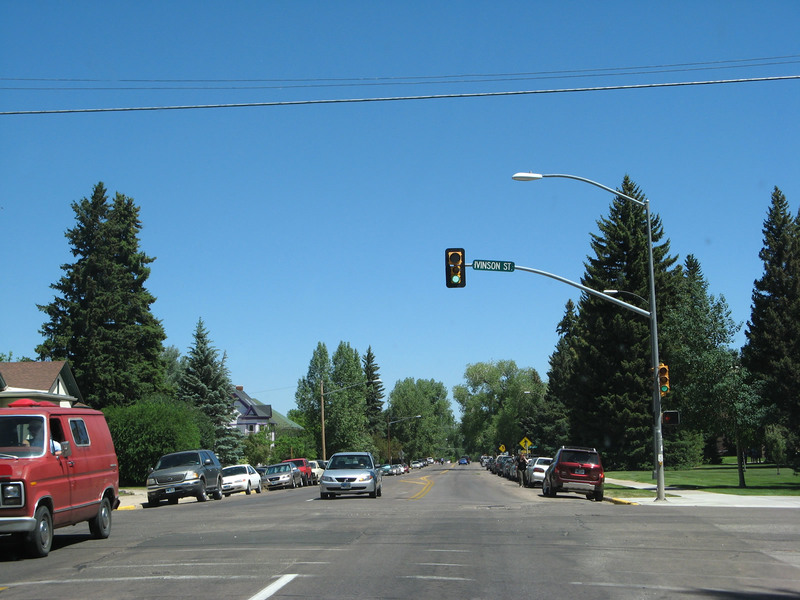 A block east of First Street, Grand Avenue meets Second Street at this traffic signal. Photo taken 09/07/05. 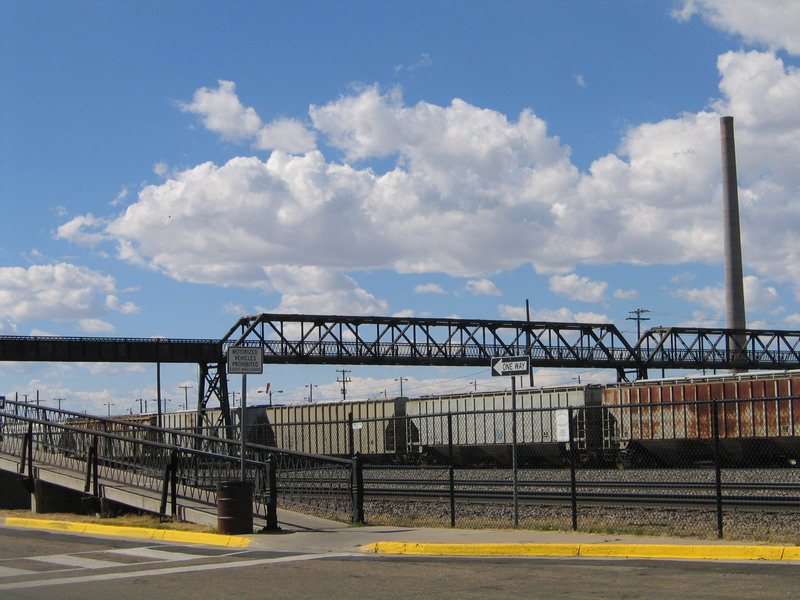 The rail yards of the Union Pacific Railroad are visible as westbound Grand Avenue approaches Second Street in downtown Laramie. Photo taken 09/07/05. 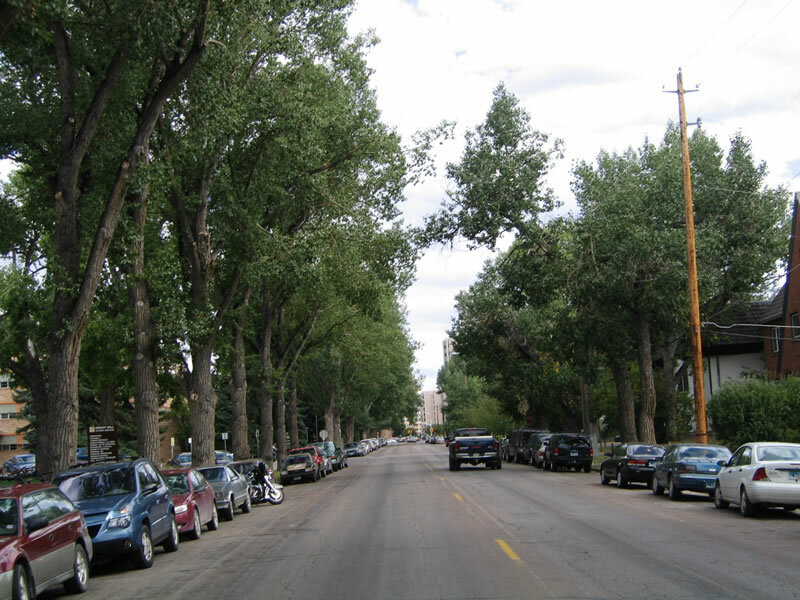 This is the view along tree-lined Ivinson Street near 12th Street adjacent to the University of Wyoming campus facing east. Photo taken 09/07/05. White Hall, McIntyre Hall, Orr Hall, and Hill Hall (dormitories) are all visible from eastbound Ivinson Street at the intersection with 15th Street. Photos taken 09/07/05. 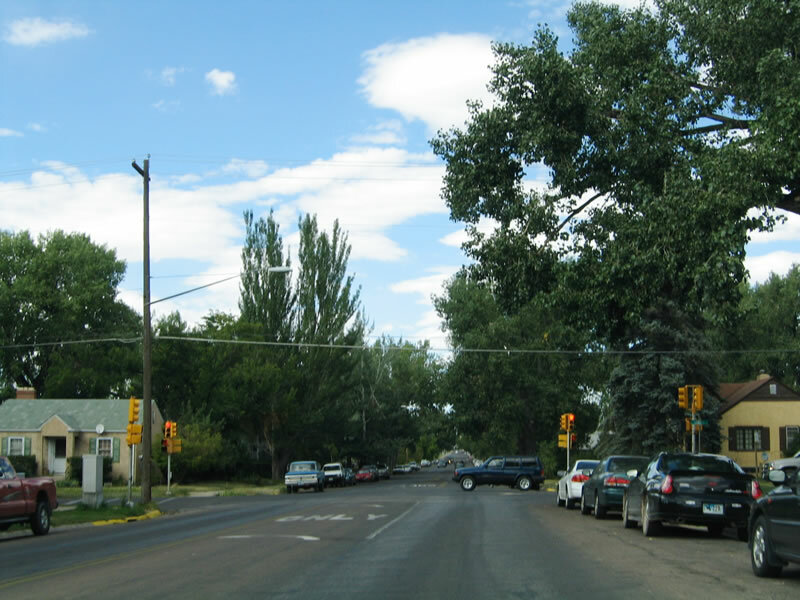 Westbound Ivinson Street travels through the "tree district" of Laramie as it passes alongside the southern edge of the University of Wyoming campus. 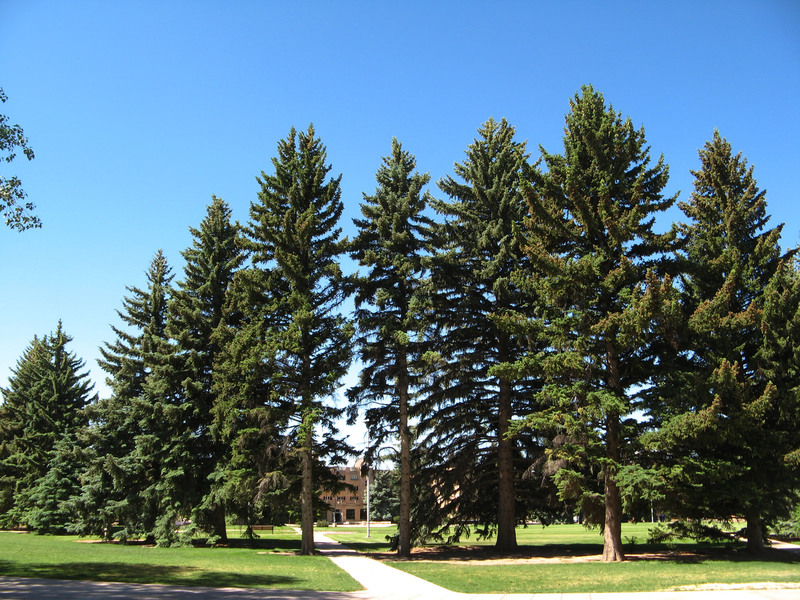 This view is located between 15th Street and 13th Street adjacent to the University of Wyoming dormitories near the College of Business. Photo taken 06/30/08. 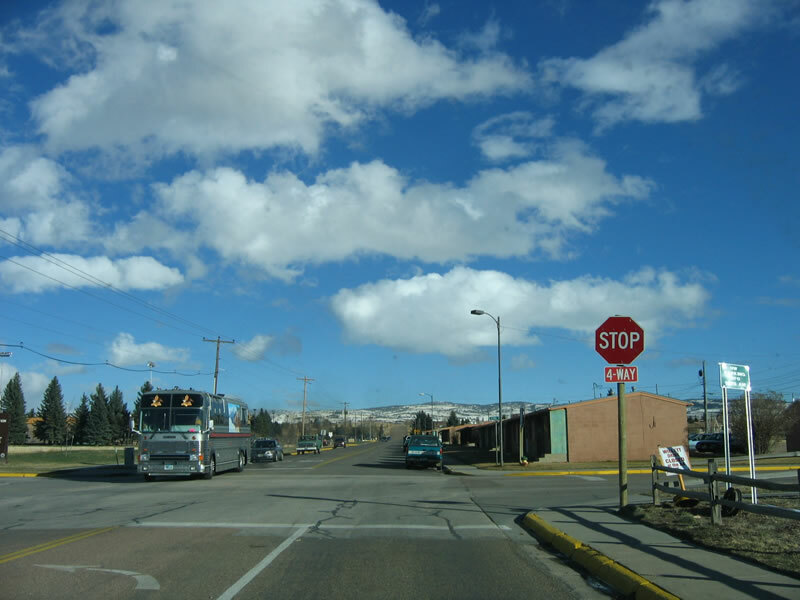 Newer white-on-brown street blade signs started to make their appearance in Laramie in the 2000s. The bucking bronco logo common to the Wyoming state route markers is also found on these blade signs. 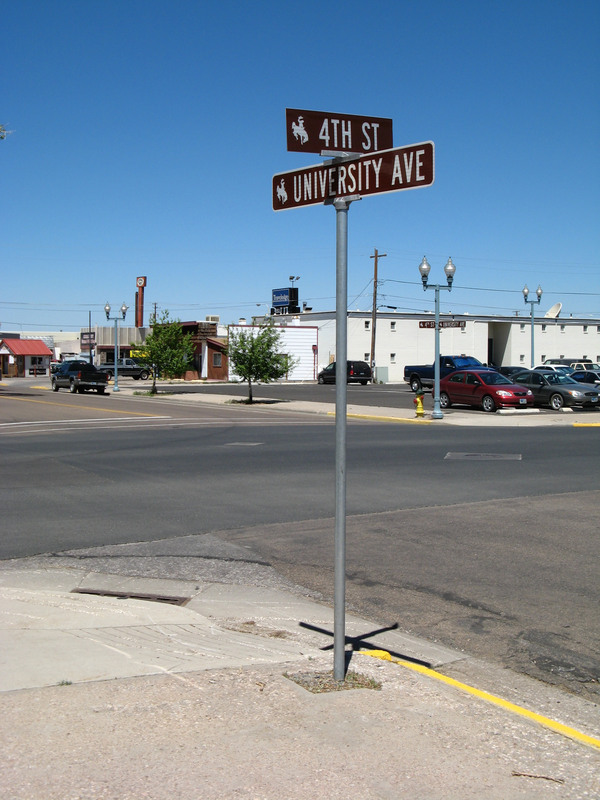 This particular sign is posted at the intersection of University Avenue and Fourth Street. Photos taken 06/30/08. 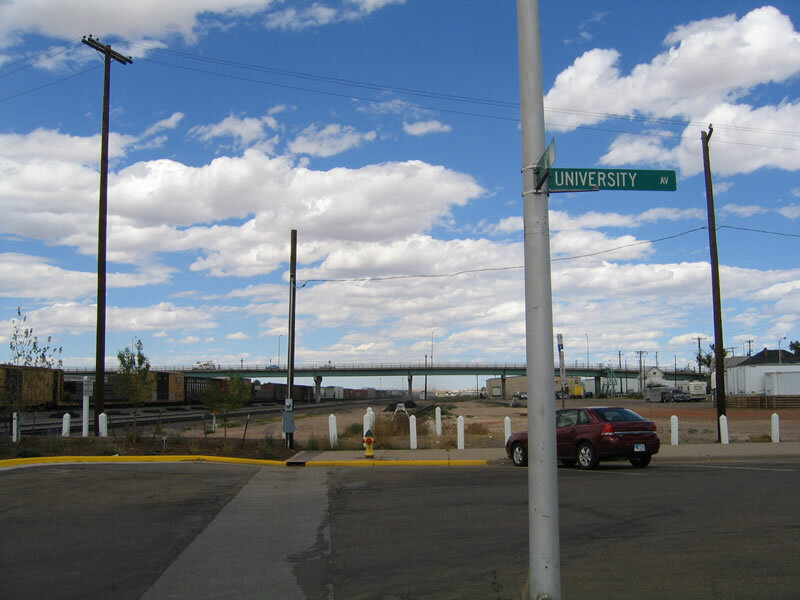 Willet Drive connects 15th Street with 30th Street through the eastern section of the University of Wyoming campus. While Willet Drive passes to the north of Fraternity Row and south of the cemetery, it provides the most direct access to the Arena-Auditorium, American Heritage Center, and War Memorial Stadium from the main campus. Photo taken 11/12/05. 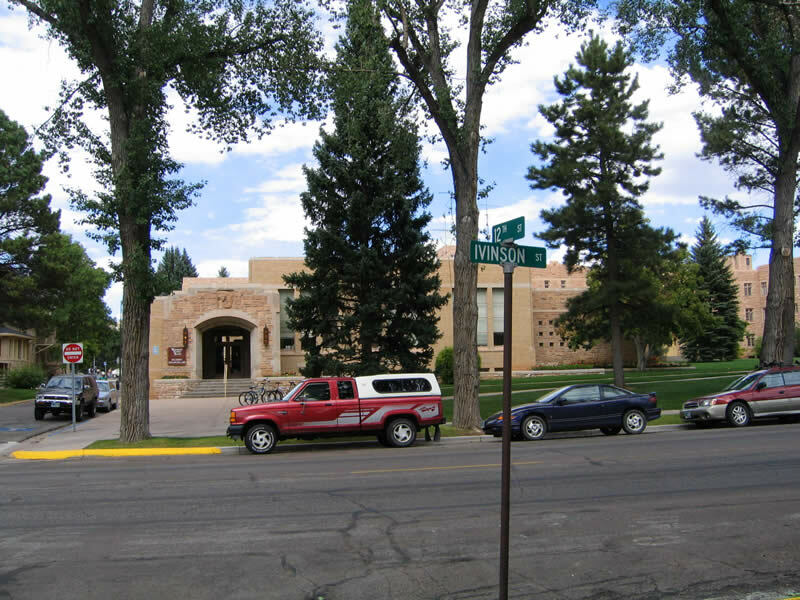 The driveways on the right (south) side of Willet Drive provide access to several fraternity houses as well as the University of Wyoming Law School. 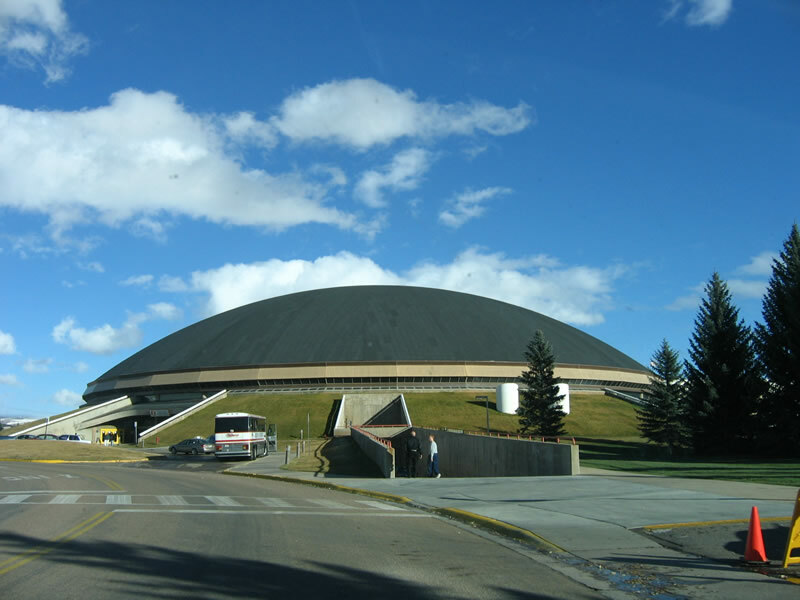 The large domed building looming ahead on eastbound Willet Drive is the Arena-Auditorium, which is home to the University of Wyoming college basketball team. Photo taken 11/12/05. The Arena-Auditorium used to have a shiny copper roof, but it has blackened with time. Occasionally, the roof is cleaned to restore it to its original copper top finish. 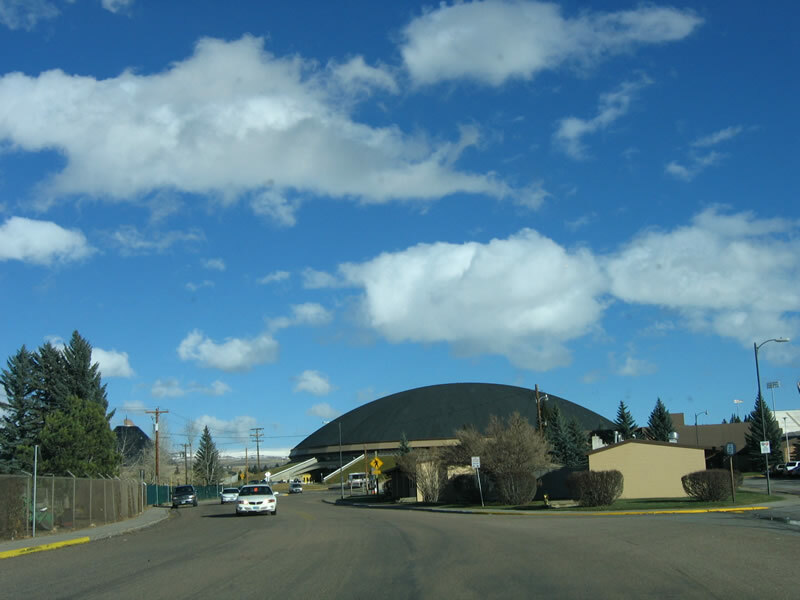 The arena is sometimes referred to as the "AA" or "Double A," which combined with the copper roof leads to a "Duracell copper top AA battery" analogy. Photo taken 11/12/05. 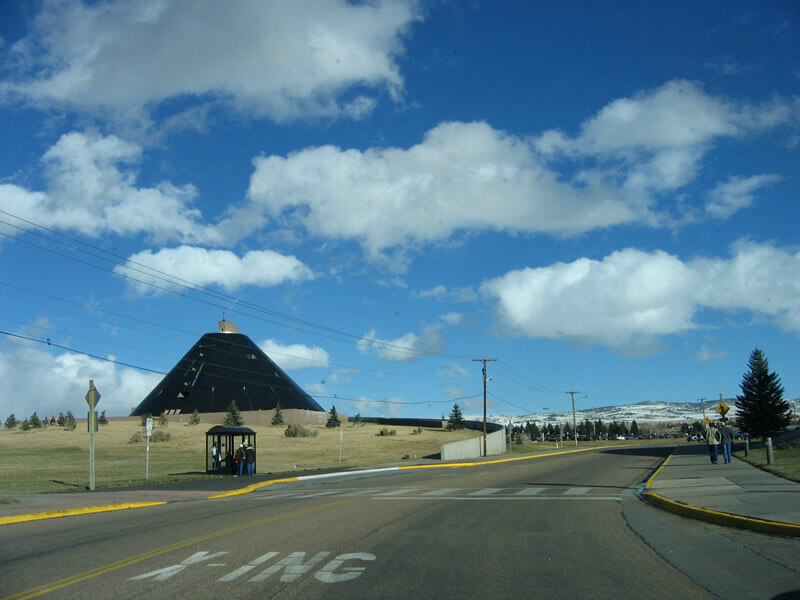 The teepee shaped American Heritage Center comes into view after Willet Drive curves around the Arena Auditorium. 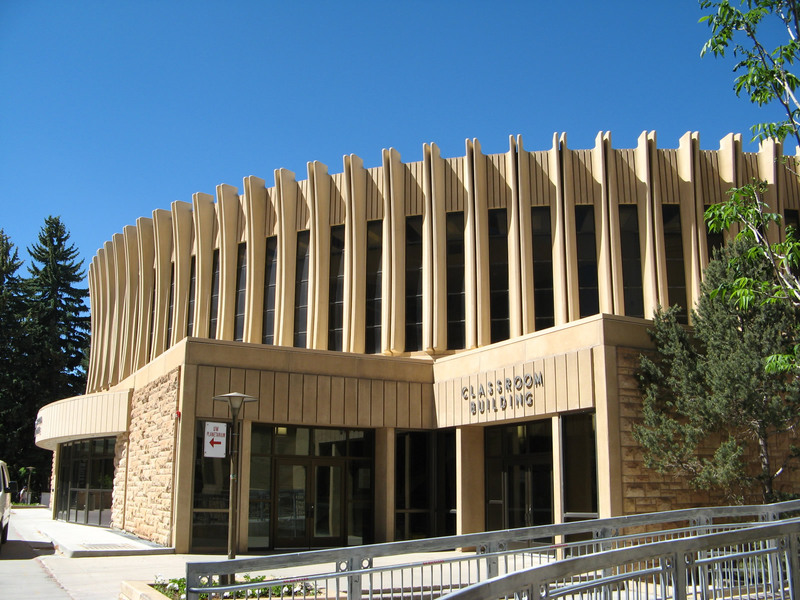 Inside the American Heritage Center are documents related to Wyoming's history as well as various journalist, historical, and political archives. Photo taken 11/12/05. Near War Memorial Stadium, eastbound Willet Drive approaches 22nd Street. Follow 22nd Street south to the main War Memorial Stadium parking lot and to Grand Avenue (Business Loop I-80 and U.S. 30). Photo taken 11/12/05. 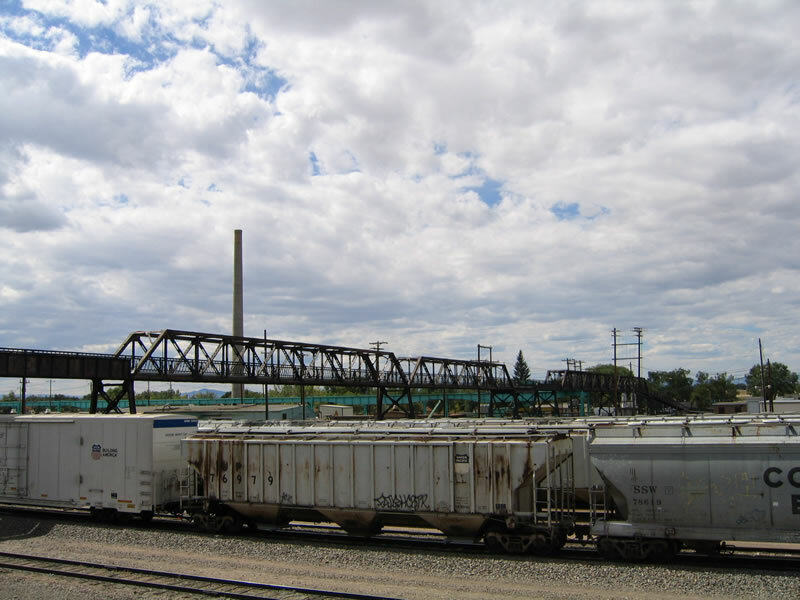 This is a view of the skyline of downtown as seen from the Union Pacific Railroad Viaduct that crosses over the rail yard. Photo taken 09/07/05. 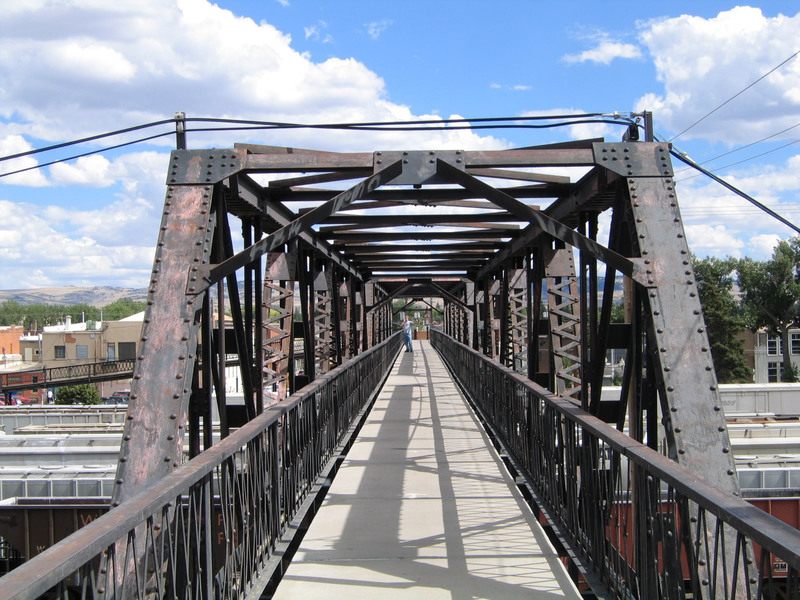 The overpass is a truss bridge built for use by pedestrians and bicyclists. Photo taken 09/07/05. At the east end of the bridge, a ramp provides access for bicycles, while a stairs provides a connection for pedestrians. Photo taken 09/07/05. This is a view of eastbound Garfield Street as seen from the viaduct. Garfield Street is an east-west street that parallels Grand Avenue one block to the south. Photo taken 09/07/05. 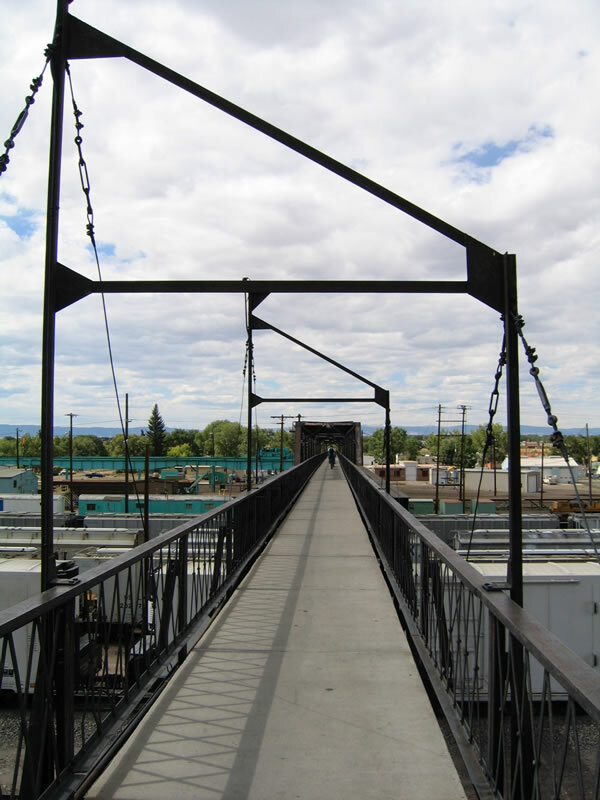 From the ramp, this is the view from the pedestrian viaduct to First Street in downtown Laramie. Photo taken 09/07/05. This is a view of the entire pedestrian viaduct as seen from southbound First Street near the intersection with Garfield Street. Photo taken 09/07/05. 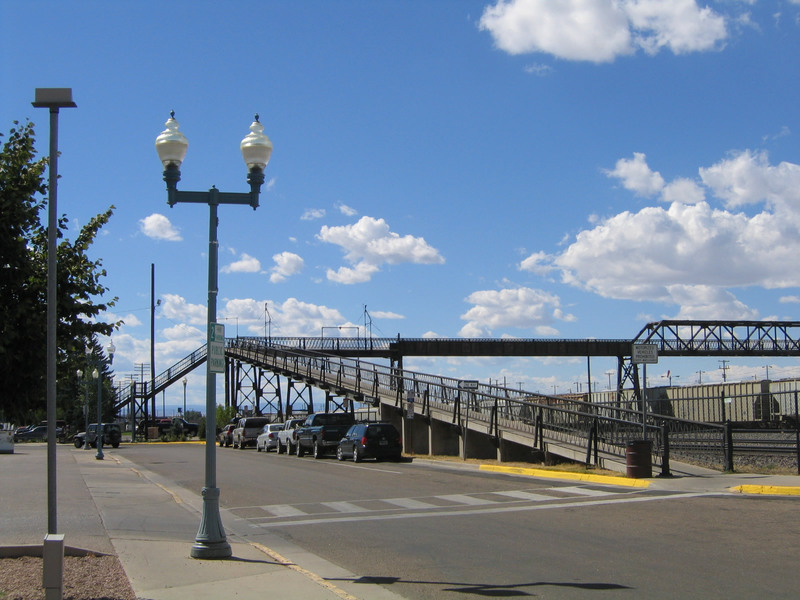 Looking west, the pedestrian viaduct offers a direct connection between First Street and West Laramie. Photo taken 09/07/05. 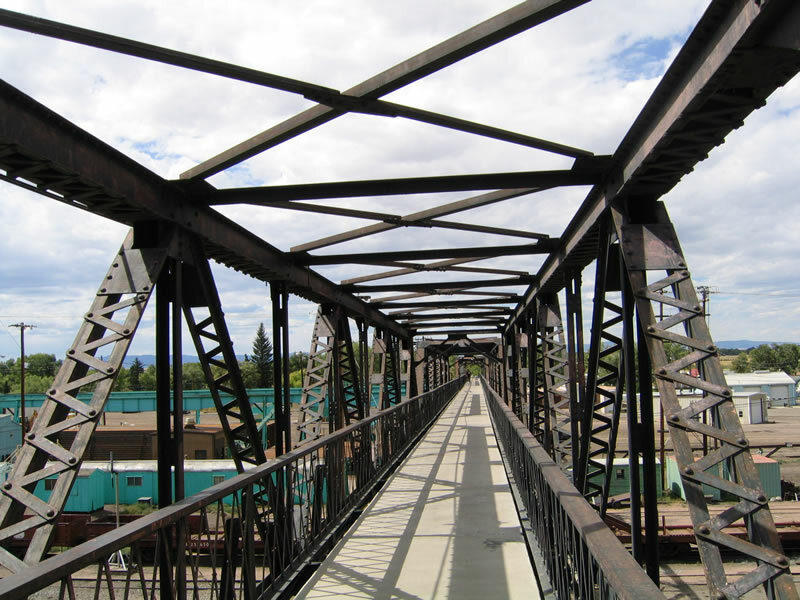 The entire bridge is built as a steel truss bridge with a superstructure that limits the height of what can pass on the bridge. Photos taken 09/07/05. 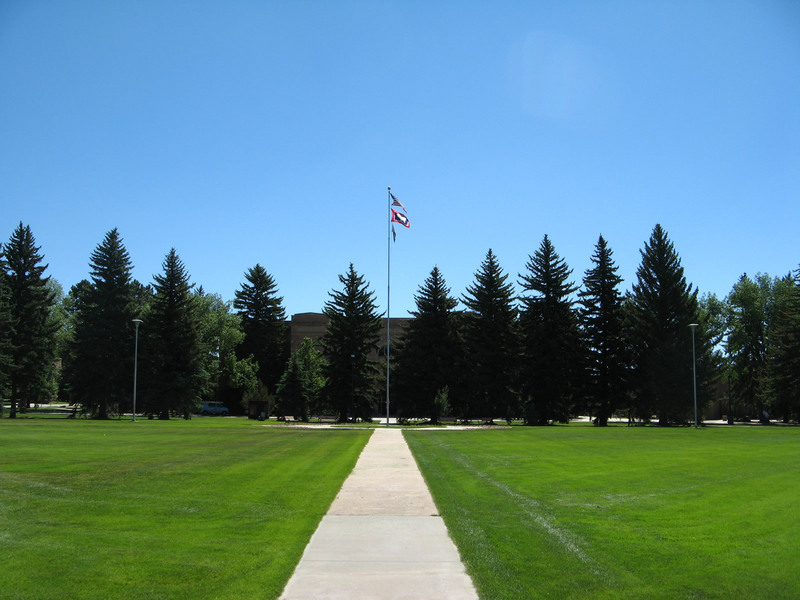 There are several entryways into the University of Wyoming. This entrance, considered to be the primary route into the heart of the campus, is at the north end of 13th Street next to Coe Library. Photo taken 09/07/05. 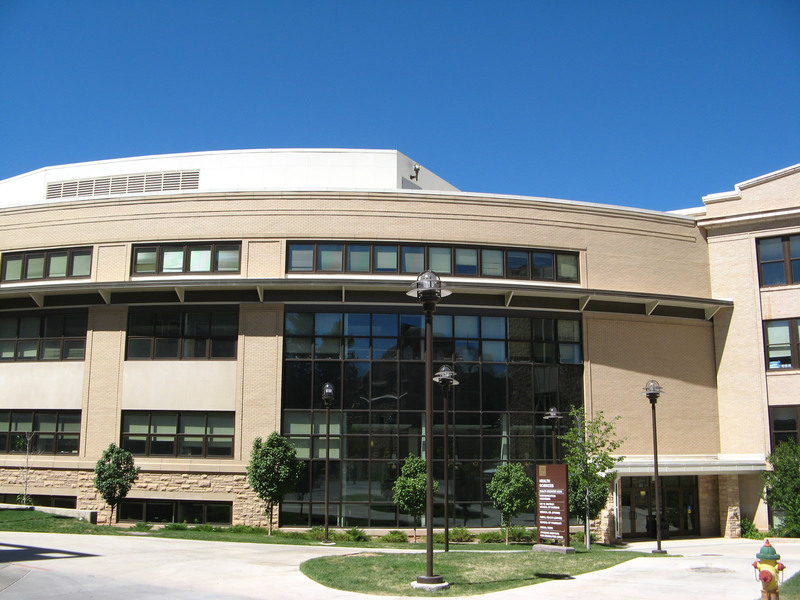 The Wyoming Union is located next to the 13th Street entrance to campus. 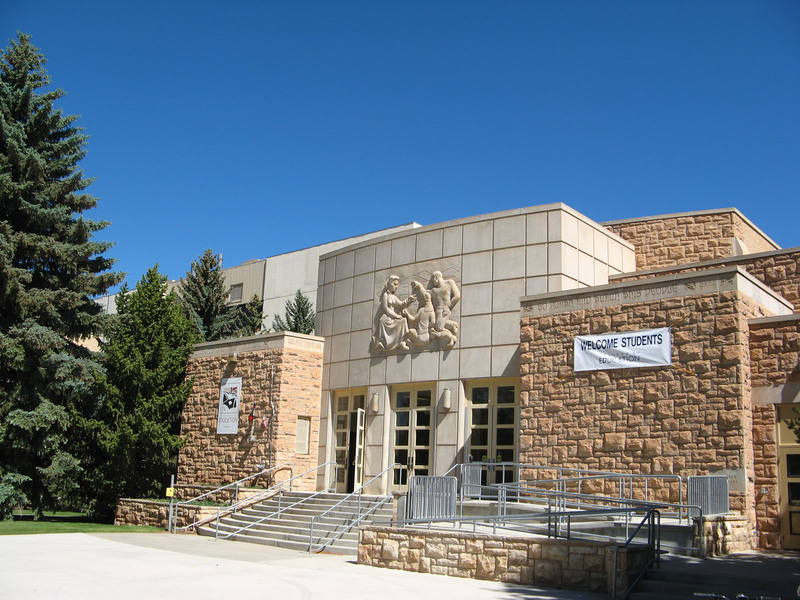 The student union was built in 1939, it was expanded several times through the years. Photo taken 09/07/05. 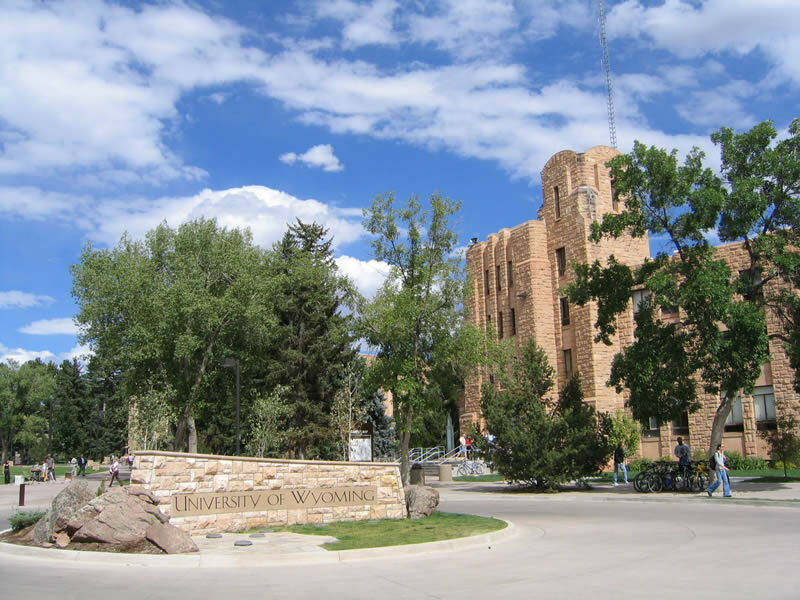 A wide, concrete walkway provides access from Willett Drive and 15th Street west into the University of Wyoming. This view looks west near McWhinnie Hall. 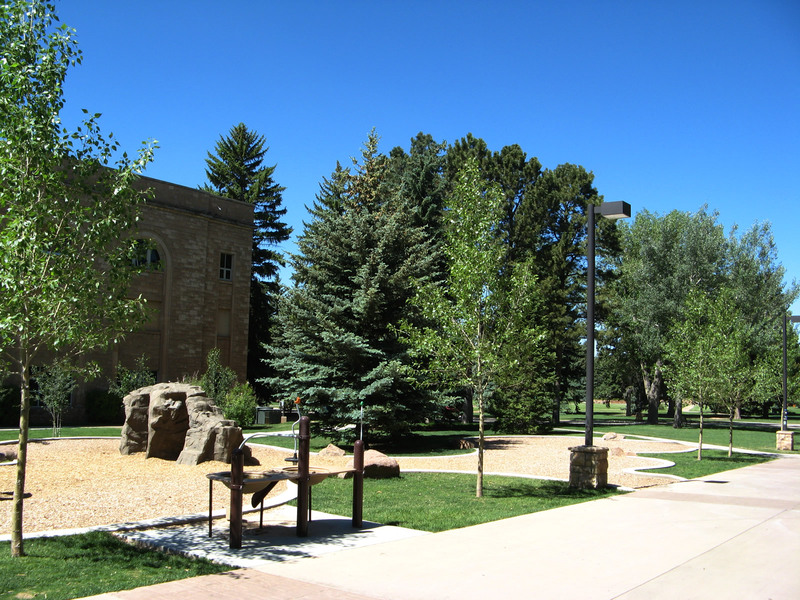 Near the Willett Drive entrance is Half Acre Gym and views toward Prexy's Pasture, the central quad on the University of Wyoming campus. Photos taken 06/30/08. 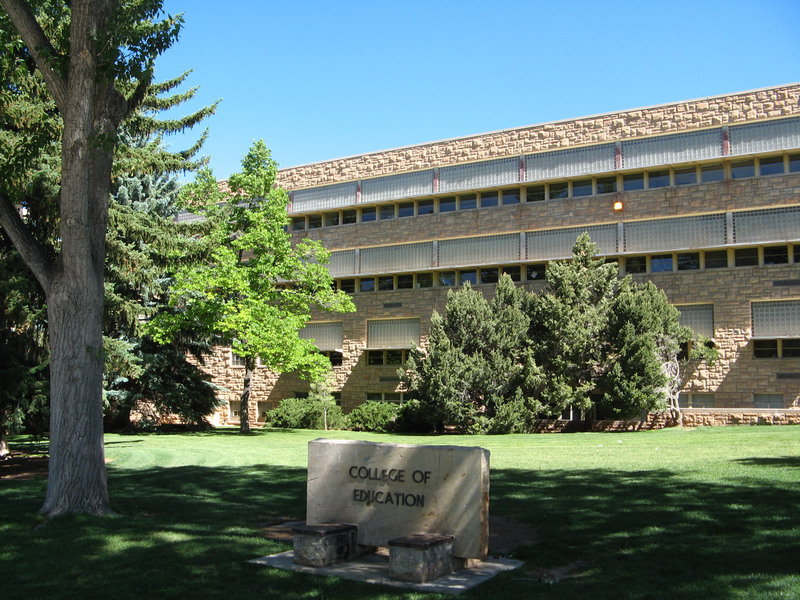 The College of Education, with its "Go forth and teach this people" inscription is just north of the walkway. 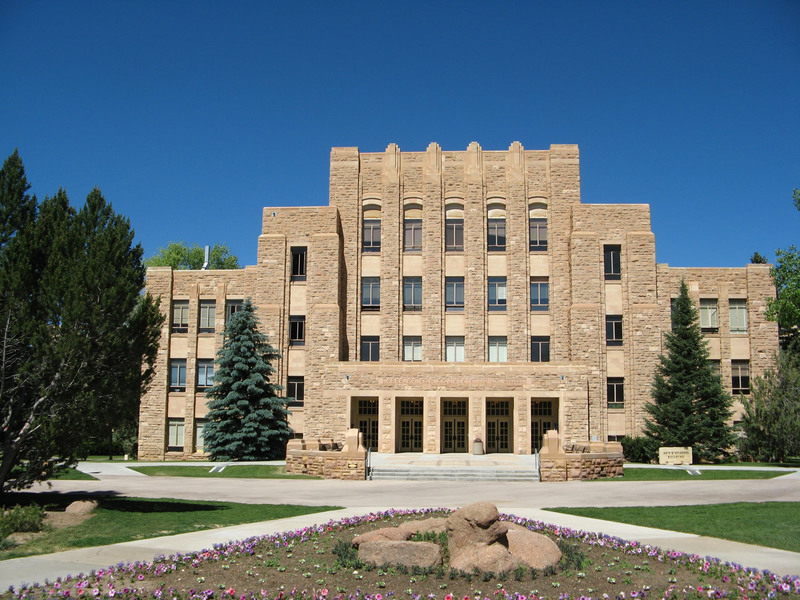 The sandstone bricks found on many of the central buildings on the campus was quarried in southeastern Wyoming and is a design theme for many buildings, going back to the original design of the university's Old Main. Photos taken 06/30/08. 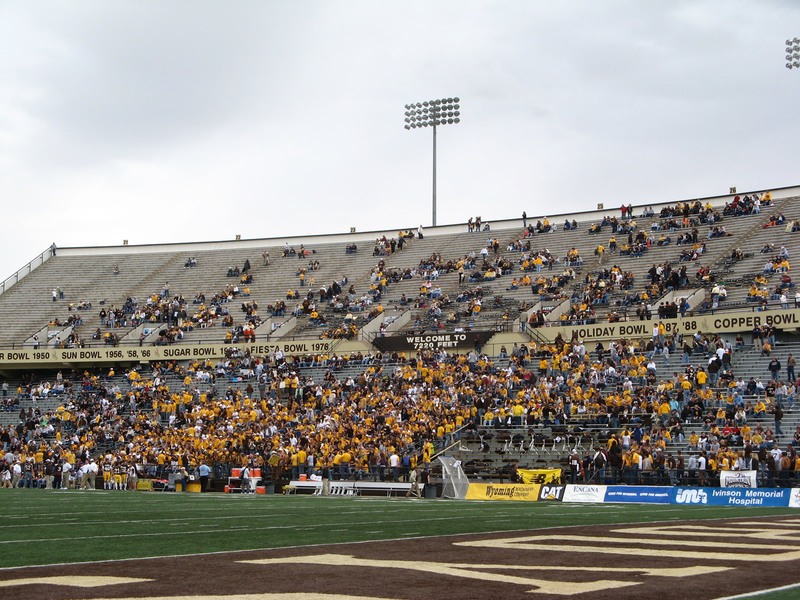 The University of Wyoming's centerpiece is picturesque Prexy's Pasture. 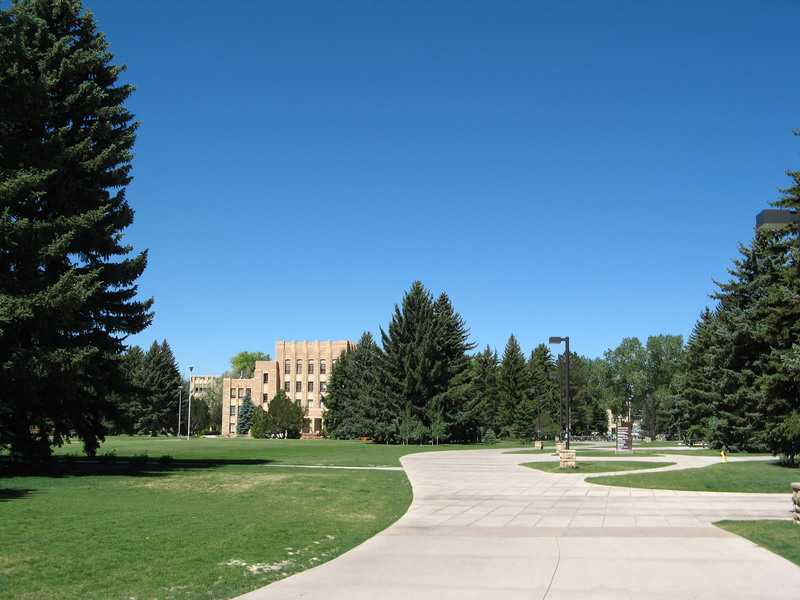 The quad is surrounded by trees, art, and buildings. 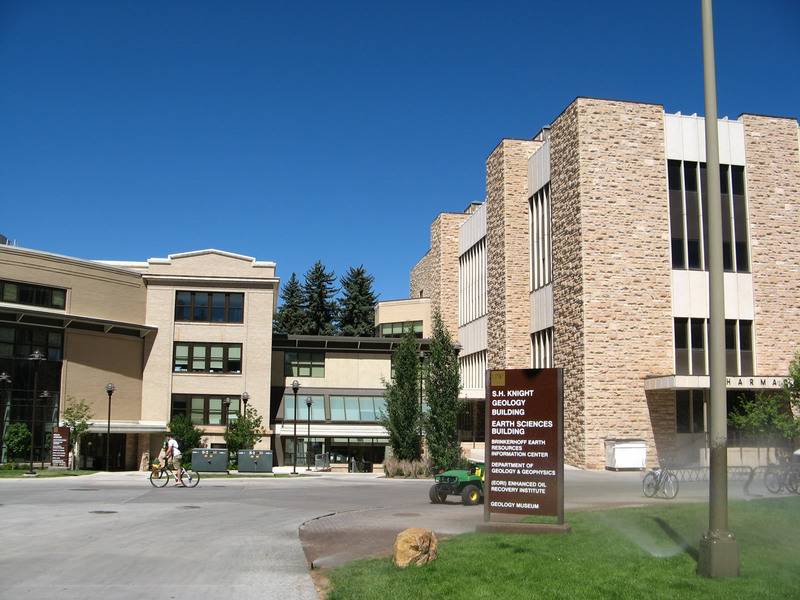 Many of the buildings feature the same sandstone facade as the College of Education. 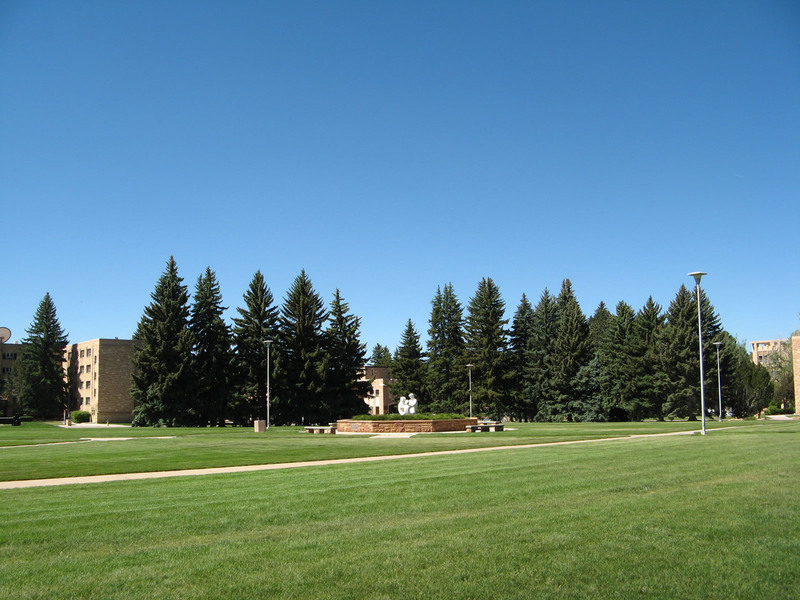 On the north side of Prexy's Pasture are the College of Agriculture and the College of Engineering. 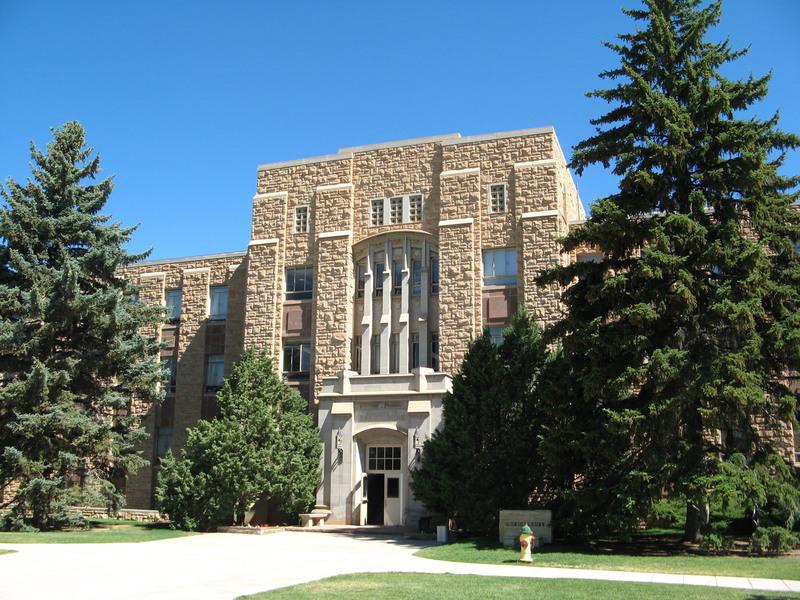 On the west side is the College of Arts and Sciences, and the south side features Ross Hall and Knight Hall. The University Family is a sculpture found in the middle of the pasture, near where several concrete paths converge and cross at odd angles. Allgedly, the paths across Prexy's were constructed based on tracking footprints of students in the snow before any paved walkways crossed the area; the paths with the most footprints became formal, paved walkways. Photos taken 06/30/08. 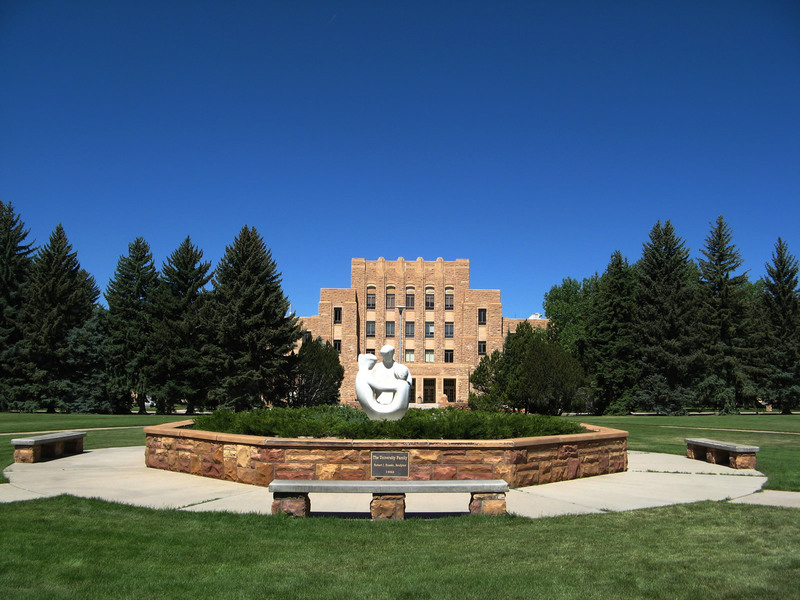 Anchoring the west end of Prexy's Pasture at the University of Wyoming is the College of Arts and Sciences. A bit to the north of there is the reknowned Geology Museum. Photos taken 06/30/08. 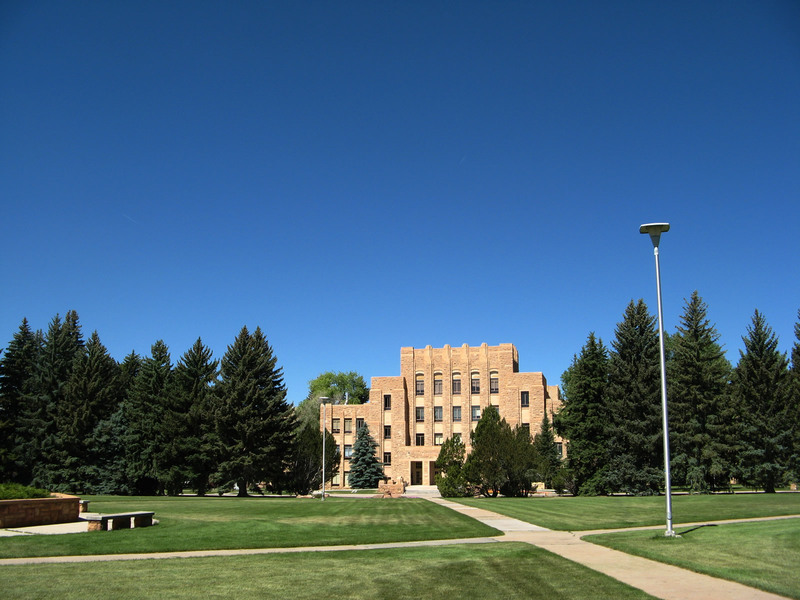 At the west end of the University of Wyoming (just before 9th Street) is the College of Health along with the Classroom Building, which features a circular design. Photos taken 06/30/08. 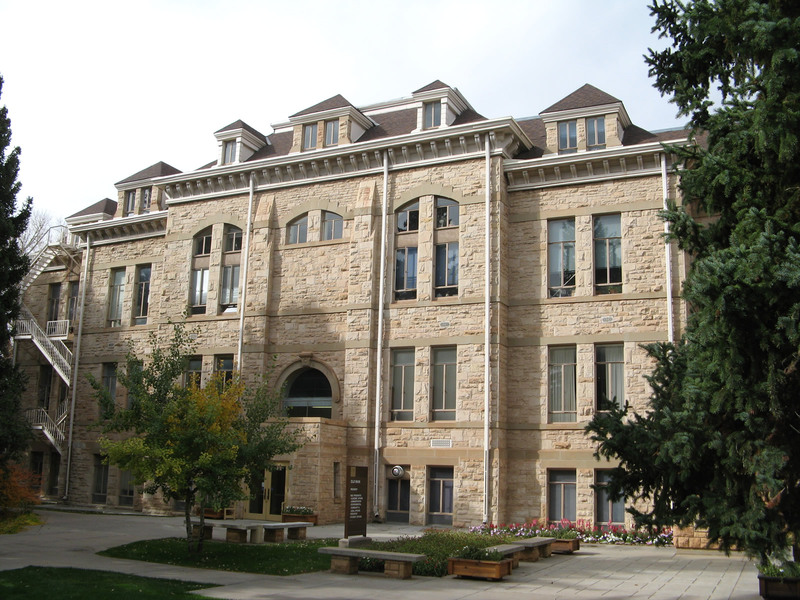 Now at the southwest corner of the University of Wyoming, we find Old Main, the original university building that dates back to the university's founding in 1886. 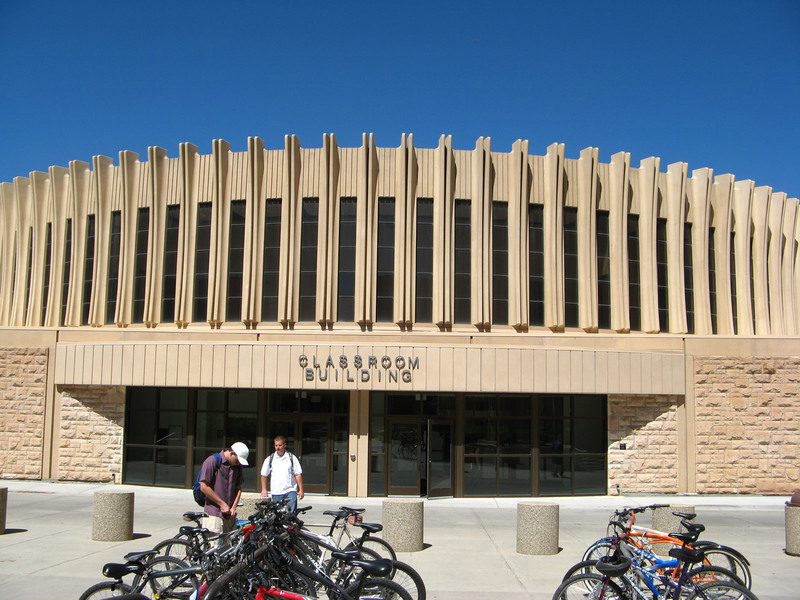 Originally the building was used for classroom instruction, but over the years it has become more of an administrative office. A nearby lawn and garden is slightly sunken to allow storm water runoff to collect during significant storm events. Photo taken 10/13/07. 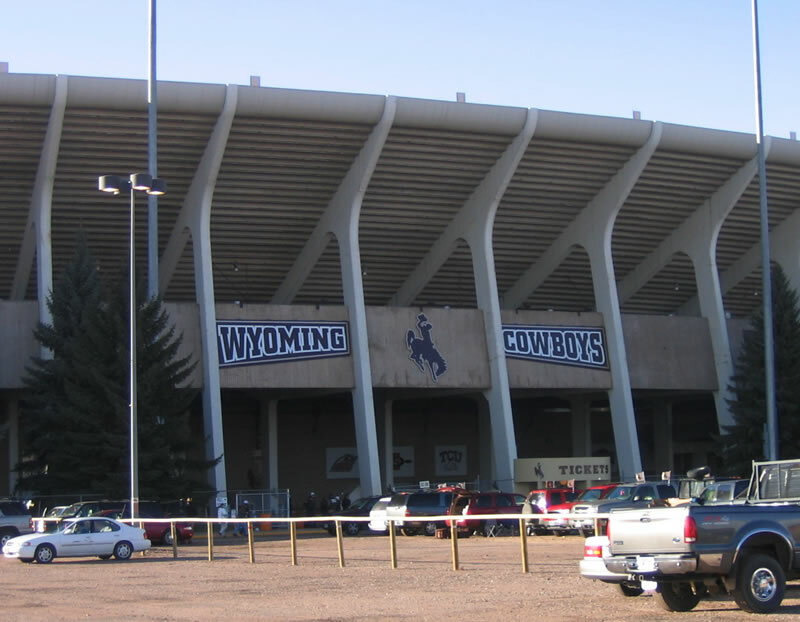 War Memorial Stadium, home to the University of Wyoming Cowboys college football team, is located just west of 22nd Street north of Grand Avenue (Business Loop I-80 and U.S. 30). 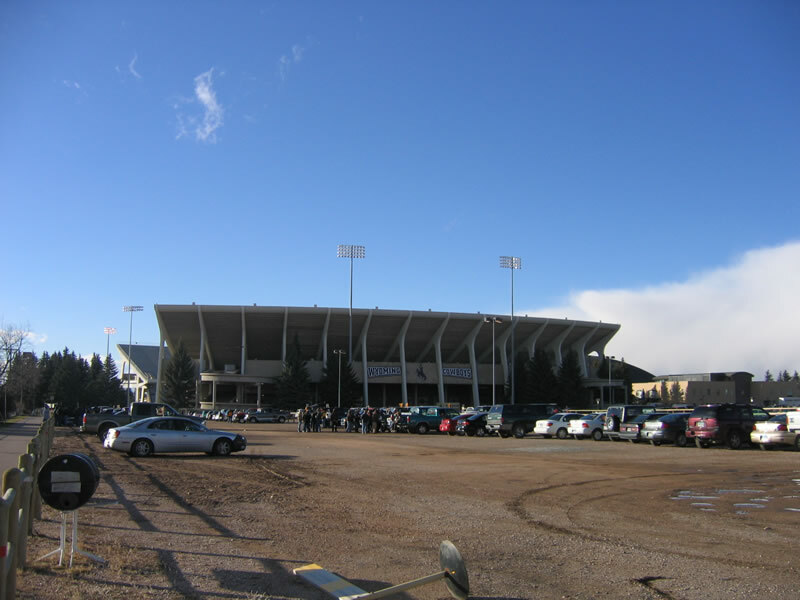 A large parking lot is located between 22nd Street and the east side of the stadium, which is shown here. Photos taken 09/07/05 and 10/13/07. Page Updated September 13, 2014.